The United Wa State Army invites ethnic armed groups in ongoing conflict with the government to a meeting at its Panghsang headquarters in Shan State. “We will talk at the meeting about how to carry out future peace talks,” Zhao Guoan, a spokesman for the UWSA, told The Irrawaddy on Friday. He added that participants would also discuss how best to resettle civilians displaced by recent conflict. Multiple ethnic armed groups in northern Shan State have clashed with the Burma Army in recent months, forcing thousands to flee their homes, with Kyaukme and Kutkai townships particularly affected. Fighting flared as recently as Thursday, when the Kachin Independence Army (KIA) and TNLA went up against government troops in Mong Baw and Kyaukme townships, respectively. Nai Hong Sar, vice chairman of the United Nationalities Federal Council (UNFC) alliance of ethnic armed groups, confirmed that the UWSA would host a meeting, but added that only ethnic armed groups operating in northern Shan State had been invited. “We heard that they will have a meeting. But, we were not invited to join it,” said Nai Hong Sar, speaking of the New Mon State Party ethnic armed group, for which he also serves as vice chairman. Leaders of ethnic armed groups with a presence in northern Shan State began arriving in Panghsang, the capital of the Wa autonomous zone, on Friday to attend the weekend meeting, according to Tar Bong Kyaw, general secretary of the TNLA. “Many of the leaders have arrived already, but still more are coming,” he said. The UWSA, Burma’s largest ethnic armed group, previously hosted a similar gathering in Panghsang, where in November it invited non-signatories to a so-called nationwide ceasefire agreement with the government. 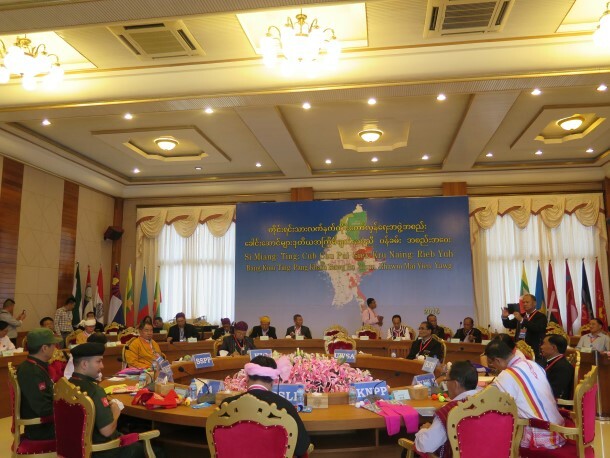 The ethnic armed groups decided at the meeting that they would await a transfer of power to the incoming National League for Democracy (NLD) government before engaging with the peace process further. Based in northeastern Shan State, the UWSA is among about a dozen ethnic armed groups that have not signed the nationwide ceasefire accord. Its leadership has not participated in the multilateral negotiations between ethnic armed groups and Naypyidaw that have played out over the last few years, saying UWSA participation was unnecessary given a bilateral ceasefire that it reached with the government in 1989. Early this year, a UWSA spokesman called a political dialogue between the government and signatories to the nationwide ceasefire “meaningless” as long as it continued to exclude certain ethnic armed groups from the process. The government and Burma Army refused to allow the TNLA, Myanmar National Democratic Alliance Army (MNDAA) and Arakan Army to sign the accord, which eight ethnic armed groups inked in October. Zhao Guoan told The Irrawaddy that all three non-signatories, as well as the KIA, National Democratic Alliance Army (NDAA), and Shan State Army-North, would attend Saturday’s talks.